In the first episode of this volume of American Dad, President George W. Bush pays a visit to Stan Smith's family for dinner. While at the house, Dubya gets drunk with Roger the alien and runs around town naked, acting like the frat boy he really is. But in the end, he's treated rather sweetly by the show, as Stan comforts the reviled world leader. What the hell happened to the sharp political skewers the series wielded early on? Is it just too easy to parody a lame duck presidential term? Or has the series simply jumped the shark? Truthfully, if what you want is biting parody, that ship sailed a while ago, as even the last collection showed a marked decline in topical humor. Here in this set, there are a few episodes that pull jokes and storylines from the political and social arenas, but for the most part, the episodes stick to traditional sitcom concepts and pop-culture references. How many times can we tell the same stories about stupid dads and frustrated families, spiced up with new careers and theoccasional space alien? It's aggravating to see the show take the road oft traveled, because when it sharpens its knives it can be wonderful, like "Bush Comes to Dinner" or "Surro-Gate," where Stan's wife Francine agrees to carry a baby for Greg and Terry, the gay local anchormen. Stan's freak-out over gay parents is perfect parody, as it takes the aggressive conservative mindset to the extreme. 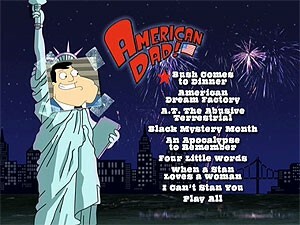 But it stands as one of very few such episodes, with the only other real examples being "American Dream Factory," where Stan uses illegal immigrants as labor to create his line of teddy bears, and perhaps "Dope & Faith," where Stan meets a new friend who's an atheist, which obviously doesn't sit well with the very conservative CIA man. That's not to say there's not some very good episodes in this set, which runs from episode 10 of the second season to episode seven of the third season. "Haylias" shows what happens when Stan activates the brainwashing he did to his daughter Hayley, giving her the best spotlight she's had to this point, while "Black Mystery Month" creates a National Treasure-like conspiracy around George Washington Carver that nerdy Steve Smith uncovers while working on a school project. And as much as I think the show overuses Roger the alien, "A.T. the Abusive Terrestrial" is great, blending a parody of E.T. with a Lifetime movie, as Roger feels ignored by Steve, and runs headlong into a negative relationship with a new boy. As noted in Volume Two, the show has fallen deeply in love with Francine (and truthfully, who could blame it?) which results in too many shows built around her, at least six of which are in this set. 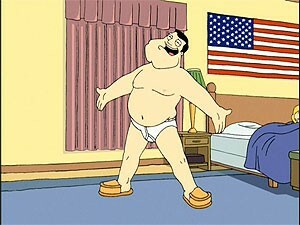 While it made for an insane gag in "When a Stan Loves a Woman," about the effect of Francine's sexual history on Stan, it also left us with episodes like "Big Trouble in Little Langley," in which Francine's pushy, adoptive Chinese parents essentially move in, pushing Stan to find her real parents. Looking past the stereotypical portrayal of the Chinese (just another in a long line of non-PC, and admittedly normally funny jokes in the show) and yet another big musical number, there's nothing much to this episode, especially the weak B-story involving Steve's pursuit of a hot girl at school. Fortunately, like the political comedy, these kinds of episodes are rare in this set. Once again, the series packs in the guest voices, including Miguel Ferrer, Iggy Pop, Efren Ramirez, Elliot Gould, Ron Livingston, Elizabeth Banks, Molly Shannon, Forest Whitaker, Eartha Kitt, Martin Mull, Jane Lynch and Paget Brewster. The 18 episodes in this collection are spread over three DVDs, which come packed in a trio of slipcased ThinPak cases. The split doesn't really take advantage of the space available, with eight episodes on each of the first two discs, and just two on the third. The disc feature animated full-frame menus, with options to watch all episodes, adjust languages, select shows and scenes and check out special features, when applicable. There are no audio options, but subtitles are available in English, Spanish and Franch, along with closed captioning. The full-frame transfers on this show are excellent, with bright, vivid color and an image that's free of any problems with dirt or compression artifacts. The only problem you might notice is the old thin-outline pixelation problem, and even that's not a major issue here. The audio is presented via bold Dolby Digital 5.1 tracks, which are surprisingly robust for a cartoon comedy, capturing the more action-packed portions of the series quite well, while delivering the dialogue strongly and clearly. The big extra, as is the tradition for DVDs for MacFarlane's series, is a commentary for each and every episode, featuring a mix of crew and cast, including writers, directors and artists, though Seth MacFarlane is only on hand for two episodes. Considering the tracks were recorded during the writers' strike, which created some bad blood between the studio and the creator, it makes sense that he's not around much, though the bitterness of the writers has perfect attendance. I don't know if it was their talk of the strike or just a general lack of focus, but I started to zone out after a bit. Your mileage may vary, but this group of commentaries didn't really do it for me. The collection of deleted or alternate scenes is a bit smaller than last time, with 66 scenes that run just over 25 minutes. There are some amusing jokes that didn't make the cut for the air, but nothing really jumped out as being very funny, with the exception of an unused take by Niecy Nash, playing Patty LaBelle. The final extra is a 53-minute cast table read of "The 42-Year-Old Virgin," held at the San Diego Comic Con, which is supplemented by stills and clips from the show. It's always odd to hear cartoon voices coming from real-life humans, especially when it comes from MacFarlane, which is the most interesting part of the featurette. Most of the actors are on-hand, with the exception of Patrick Stewart and Curtis Armstrong, and it's a pretty good piece of content, like the stage "performance" on Volume 1. That's all there is here, which is surprising, considering the previous releases. I can't say I'm a huge fan of animatics, but to eliminate them and have no featurettes is a bit weak. 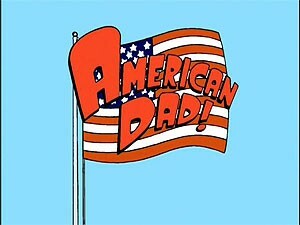 Despite boasting a concept that seems a tad limited in depth, "American Dad" keeps chugging along, using Stan's CIA-powered uber-patriotism as flavoring, while focusing on his wacky family life. The DVDs look and sound very good, and have the usual McFarlane-empire complement of bonus content, though it's a deal slimmer than usual. If you're a fan of the series, you'll certainly want to see the uncensored versions of the show, though unfortunately the politics continue to take an increasingly further backseat.